Today Punjab’s University of Education is announcing the Merit Lists 2017. This is first merit list of the Admission Fall the year 2017. The merit list of all Programs of session Fall 2017 will be uploaded on the official website of the public sector Government University. Previous it was known as the Education colleges in all over Punjab province. The detail merit list will be available on September 22,2017 After noon at 02:00 PM (Friday). We hope good luck for you for the admission in the University of Education, Punjab province, There are 11 different campuses in the Punjab, They are located in 7 different cities of Punjab. Large campus are situated in Lahore, Multan and Faisalabad cities. Last date for submission of application form was 20th September 2017. The application form was available online at the official website of the University of Education. The admission process was started on the 1st August 2017. If You Want to Get the Confirmation online of the Merit List , Write Your Name, Roll Numbers, CNIC, Programs, Shift (Morning/Evening) and Campus Name in the Comment Box Bellow. Aoa sir mra name waheed hai ma Ny D.A.E kia hai or ma ny bs i.t karni ha plzzz ap bata sakty hen k D.A.E waly students k lye bs i.t me seets hen agr hen tu kitne seets hen plzzz sir kindly bata den…..??? plz tell me my name in list..
Iqra ahmed CNIC 37405-1754036 M ahmed khan. sir jis ka first merit list ho agr wo fee pay na kar skay to kia us ka nam 3rd merit list main aa skta hai ya wo 06-10-2017 tak fee pay kar skta hai? BAed hons ki 3rd merit list KB lagy ge? OH. yOU ARE LOOKING FOR iSLAMIA uNIVERSITY bAHAWALPUR mERIT lIST. B.ED(hons), bs mathematics, bs physics all morning shifts. Good Luck Next Time for all Subjects. Dear Bareera Write Your Campus Name. Sir mera name waiting list mein 62 numbr pe hai bta den ap a jaye mera 3rd list mein? Plz bta dain me ny form submit krwaya tha dono shift ka lakin mera name abi tak nai aya .. Mera form submit hua ya nai?? Name ku nai a rha mera list me?? Plz bta dain..
Bakhtawar Akbar id card no 35202_3464288_6 kindly tell my name is in 2nd merit list bankroad campus? Division of science and technology, township Lahore. Sir 2nd merit list attock campus kab lagy gi?? The Second merit list of Admission Fall 2017 in Education University will be uploaded online today on Wed, Sept 27. Insha-Allah. Your name not in first list. Please wait for 2nd Merit List issuing today..Good Luck! Dear Congratulation Your Name is present in both Morning and Evening List. M.Asad s/o ch muhammad arshad. Your name is not included in First merit List of BS Physics. Good Luck Next Time. Muhammad Asad s/o ch muhammad arshad CNIC NO:36201-1862878-9 sir plz tell me my name for BS IT evening shigt. Please confirm my name in 1st merit list? Dear Your Name not in the List of BSIT in Multan & Faisalabad Campuses. 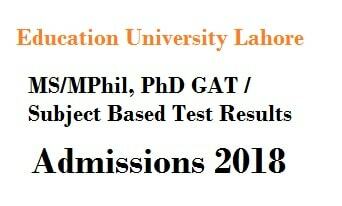 70.28 percent wly ko admission mil sakta ha BS IT ma mra naam waiting list ma ha plz tell me fast…..
lahore ka campus ma admission mil sakta ha????? Is my name in merit list? For your Kind information that following below form for BS Botany admission, I have already submit form with Callahan in campus Division of Science and Technology, Township, Lahore dated 18/09/2017, D.No 5281(Callahan copy of student available) when my merit is 83.68 in BS admission but my name is not available in merit list in BS Botany. My subjects in Physic, Bio and chemistry FSC and matric. Yes, It is not in the List.. Why? i m M.Zohaib..Sir plz tell me about the 1st merit list of BS MATHS in division of science and technology township campus lahore. so sir i am eligible for the bs it in campus or not? Tell me your Campus Name? Roll no:15672 and 15673(Evening and Morning i apply in both shifts. Mera name ist list me hai ya nai??? Name: muhmmad amadudin talha. Father name : Ashiq Hussain. Id card 32303-9127156-9. Programme : BS math shift : morning campus: division of science and technology, town ship Lahore. Sir Mera list men name Nahin Aya . FSC marks 897.plz jaldi batan den. Sir mene aply bhi Kia Tha .challan bhi pay Kia Tha. Sir please give me details about 1st merit list that whether my name is on that list or not ? Plz tell me mera name ist list me hai ya nai??? Dear admin,,jin students ka naam waiting list mein woh kia karen? Mashal can u tell me which sentence is write in Website block ? jawariah g apka english main name aya? Admin has not replied yet…. Dear Congratulation. Your are in the List..
Dear Muneeb, Write Your Name, Program and campus with Shift.. Please. Dear Asma, Write Your Name, Program and campus with Shift.. Please. Dear Kaleem Ullah, Write Your Name, Program and campus with Shift.. Please. Waqar Aslam .CNIC;36602-7488925-7.Bs Chmistry in Vehari Campus Tell me result sir. Write Your Name, Program and campus with Shift.. Please. Dear Kanwar Write Your Campus Name Please. Your name is not in 1st Merit List. wait for 2nd Merit List. Kindly send me merit list of Bba evening program. Sir plz bta dyen mera name 1st list ma ha kya? List qu nahe show ho re . Whats the problem ? When MBA merit list will be display..?? o abhi takh merit list q ni laghee abhi tak ?? 3510272273200.Msc chemistry Division of science and technology, township, Lahore. Aj bank road campus ki merit list display honi thi abi tk ni hui kb hogi display????? Ab bata b dyn …. sir merit list kb upload hogiiii????? Excuse me if u hv downloaded the list then tell me ,my PDF is not downloading. Dear Campus Name Please Write. 3510272273200.program Msc. And division of science and technology township campus. R morning shift the. Ali Ahmed Roll #523482 CNIC#36501-5079777-3 BS- zoology Morning division of scince and technology lahore college road. Plz tell me about first merit list because website is not opening. Sir M.A English from bank road campus and M.A special education from lower mall campus. sir merit list show q ni ho rahiiii…. Sir list kb show hogii?? Sir I’m waiting for merit list till 7 to 8 hours..I don’t know what are u doing…..
plz tell me sir am waiting…..
sir or kitna w8 krna ho ga …..? Sir bank road waly campus ki merit list kb upload ho gi? Javeria Khalid MSC zoology lower mall campus..
sir bank road 1st merit list kiu ni show hu rahe? sir bank road camps ki 1st list show kiu ni hu rahi? My name is Aqsa Bibi.My CNIC no is 3660252837232.From no is BW015804(Morning).MY programe is BS chemistry.MY campus is vehari. Sir kb takdisply hogi list? Sir plz tell me about merit list ? Why would it not be opnd online? Merit list is still not shown? Write Your Name, Program, Campus and Shift..
Tell me the merit list ..
for your help we need your contact info …. merrit list kb lgni h?? where is the merit list??? we need your whats app number and further your details and about the campus and subject…. today is 22nd september 2017..How much time u take more ? what you r doing admin?? When u upload the merit list?? kab lagy ge merit list? students are still confused. where admin please send LINK If merit list is displaced. Plz tell me about the merit ??? Bs hons physics township campus. muhammad imtiaz serial no 206 and 3210203758893 and bs it dg khan campus plz sir tell me ? sir plz merit list kb lagy ge ? Dear Mian Muhammad Ahmed Campus Name? Sir ye kb tk upload Ho g??? ????? Dear Adeel Write your Campus? Please write your name, CNIC, Program and Campus Name?